hello! trilogy are a brand that have only recently came to my attention. i read so, so many beauty blogs and i’ve seen a bit of hype building up over the past month or so around the brand, so it’s no surprise that they ended up in my skincare stash. i was in the market for a new cleanser, so when i saw sophie talking about trilogy active enzyme cleansing cream on twitter, i decided to look into it. it’s quite a thin, creamy texture that feels ever so slightly exfoliating when you apply it. the active enzyme part reminds me of the elemis papaya peel and has a similar brightening effect after you wash it off with a warm flannel. after cleansing my face i’ve been spritzing on the trilogy hydrating mist toner, which has quite a strong rose scent (luckily it doesn’t linger too long, as rose isn’t my favourite) but is so refreshing. i’ve never really noticed a difference with a toner previously, but i do genuinely think this has been keeping any dry patches at bay. my favourite product of the bunch has to be the trilogy certified organic rosehip oil though. i’m so impressed! oils have made a huge difference to my skin in the past month, so this one has been a welcome addition. the rosehip oil feels like velvet on your skin, isn’t greasy and hasn’t caused any breakouts. it leaves skin hydrated, even looking and helps a lot with congestion to give you a more refined complexion. oh and even though i’ve already used the 20ml size bottle a lot already, it’s hardly made a dent so it should last you a pretty long time, which is amazing for the price. overall i’m very impressed with my first venture into trilogy products and i think combing the active enzyme cleansing cream, hydrating mist toner and rosehip oil has genuinely made a positive difference to my skin. 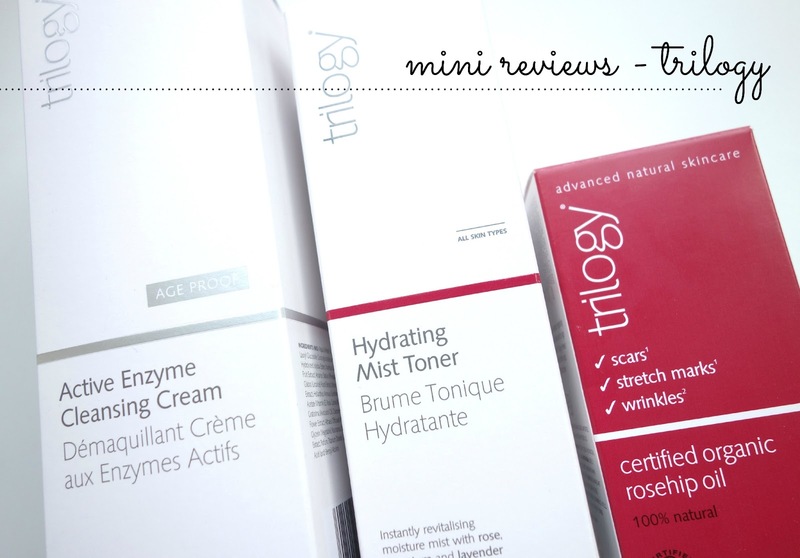 i’d love to try other products from their range, especially one of their serums, so no doubt you’ll be seeing more of trilogy on my blog. have you tried any of their products? what would you try from the trilogy range? make sure you’ve checked out my giveaway to win 14 beauty products! ps. take a peek at these two lovely blogs: fashion and cupcakes and pierrelecat!